In the Conclusion of his book, Jeffrey Bercuson tells us that G. A. Cohen ‘has been an implicit interlocutor of the preceding chapters’ (137). It is not until this late stage, that we learn that the overarching aim of this slender work, has been to rescue Rawls from the critique leveled by Cohen, and others, according to which ‘Rawls’s political theory fails because it pays insufficient attention to the necessary other-regarding dimensions of political life’ (137). To achieve this end, Rawls’s classic texts, A Theory of Justice and Political Liberalism, are read through the lens of the more recently published Lectures on the History of Philosophy and it is argued that these lectures show that Rawls is less of a Kantian than is generally assumed, that he in fact adopts elements of Hegel’s critique of Kant, and is also influenced by Rousseau. There are therefore two aspects of Bercuson’s undertaking that suggest themselves for evaluation; one is the adequacy of the proffered rereading of Rawls, the other, the question of whether the reading developed does rescue Rawls from Cohen’s style of critique. At the same time, there are places where I found Bercuson’s discussion of Rawls’s interpretation of the history of political philosophy unsatisfactory. For instance he calls Rawls’s interpretation of Kant ‘idiosyncratic’. Rawls interprets Kant as fundamentally interested in the moral individual, ‘not conscientious political activity’ (9-10). So, the Kant with whom Rawls engages is the Kant who offers an account of pure practical reason, not the anthropologist who discusses moral and political practicalities in the light of our embodied selves. In fact, Rawls’s interpretation of Kant, is hardly ‘idiosyncratic’, despite recent attempts to place Kant’s anthropology at center stage. In the end, however, the question of whether Rawls’s interpretation of Kant is ‘idiosyncratic’ is something of a side issue. Undoubtedly, as Bercuson argues, Rawls’s justice as fairness is a political, not a moral conception (22). Giving up on Kant’s universalist claim, that to be a moral agent is to want to govern oneself by a universally applicable rational law, resulting in a categorical imperative, knowable a priori, Rawls historicizes Kant, so that, ‘What justifies a conception of justice is its congruence with our deeper understanding of ourselves and our aspirations, and our realization that, given our history and the traditions [of] our public life, it is the most reasonable doctrine for us’ (23). It is here, surely, that Rawls’s methodological assumptions are most questionable. How does the idea that reasonableness is ‘the outcome of moral experience under favorable political circumstances’ (24) amount to anything more than the claim that things seem reasonable to us, because they correspond to what we are used to? Unfortunately, Bercuson does not stop to ask whether history and tradition can ever provide a reasonable justification for a doctrine, or whether liberal political theory can, in the end, be justified independently of the particular comprehensive, moral conception of the good life, as involving the exercise of autonomous rational agency, developed by Kant and other seventeenth and eighteenth-century, Protestant political thinkers. Bercuson finds elements of Hegelianism in Rawls’s interest in the moral development of the child in the family (45). ‘Like Hegel, for whom the first moment of ethical life takes place in the family, Rawls begins his discussion of moral development in early childhood’ (45). In this, and in the next chapter on the Rousseauvian dimensions of justice as fairness, Bercuson sees this influence on Rawls as essentially positive, and completely ignores the well developed tradition of feminist critique of Rawls’s liberalism, which points to the tension between traditional conceptions of family life, and the full realization of equality of opportunity for women and for children brought up in the differing family backgrounds that result from actual pluralism. This is a significant oversight, and Bercuson misses an opportunity to defend Rawls’s position, by failing to consider such social issues and tensions. This leads us to the question of whether this reading rescues Rawls from Cohen’s critique. The latter question depends, of course, on what one takes that critique to be. As I read him, Cohen understands Rawls’s political liberalism to be an attempt to ground a liberal theory of justice independently of any particular metaphysical moral doctrine or ‘comprehensive doctrine of the good’. And Cohen’s line of attack is that this attempt is incoherent, because a liberal theory of justice cannot be formulated independently of a liberal, egalitarian conception of the good. This way of understanding Cohen’s challenge is clear in his discussion of the late Susan Moller Okin’s attempt at a feminist extension of Rawls. Certain conceptions of women’s appropriate sexual behavior, or traditions of family life, are simply incompatible with full equality of opportunity for women. A political conception of justice, fully worked out to take account of sexuality and sexual difference, will therefore, have to take a stand on these issues. Gay marriage and the debate over the ‘burka’ mark the line of tension between a political morality of citizenship, and conflicting comprehensive doctrines of the good. It is a drawback of Bercuson’s book, that he follows Rawls in framing political issues in a highly abstract vocabulary, and general claims are not illustrated by concrete examples. So one is forced to second guess what the doctrine of ‘robust reasonableness’ is intended to imply with regard to such issues. He claims ‘citizens must actively seek to make the social and political world a home for all,’ and that ‘robust reasonableness demands meaningful recognition, not begrudging tolerance or belittling acknowledgement’ (136). But this just brings out the tensions in a moral conception of the self as an equal participant in the political sphere, and the claim that this political morality is independent of any comprehensive conception of the good. How can the liberal feminist, committed to the reasonableness of women’s equal political participation, offer more than begrudging toleration to the woman who claims that her faith requires her to behave in a ways incompatible with her equal political participation? How can the devout Christian or Muslim offer more than begrudging toleration to those who behave in ways that they believe to be deeply immoral? It is arguable that only certain comprehensive doctrines of the good are compatible with the morality of liberal citizenship, and if this is the essence of Cohen’s critique, then Bercuson has done nothing to allay it. In fact, Bercuson submits that ‘there is little disagreement between [Cohen] and Rawls. In the end, Cohen’s critique gains its traction only by emphasizing the insufficient socializing capacity of the basic structure’ (139). He goes on to claim that, ‘On Rawls’s view … The rules of the basic structure, … cannot help but transform the morality of individuals to those rules’ (139). On this way of reading Rawls, the political morality of liberal justice will ultimately eliminate those conceptions of the good life that are incompatible with it. So far as I can see, this does not amount to a rescue of Rawls from Cohen’s critique. It is rather, a complete surrender. Ultimately, it is not sufficient, in order to rescue Rawls from his critics, to point out that there is a moral element in the concept of robust reasonableness, and that Rawls believes that children will not come to develop moral sentiments willy-nilly, but need to be nurtured in an environment that promotes self-respect and ethical dispositions. Every stable system of political organisation will need to educate children to acquire the moral sentiments appropriate for the reproduction of its institutions. The principles of political justice which Rawls suggests are fundamental to our tradition require that children are nurtured to develop tolerant attitudes of mutual respect, and dispositions that foster equality of opportunity. But to impose the appropriate child rearing practices on families, whose political and religious traditions are completely at odds with such moral dispositions, itself conflicts with pluralism. If we accept pluralism because, unlike Kant, we no longer believe in the a priori truth of the categorical imperative, what justification can we find for political institutions that were grounded in the progressive faith that all humanity had within them the capacity to recognise this a priori truth? If a theory of liberal justice is simply the exploration of implicit principles which are ‘ours’—in a manner analogous to the way in which a theory of grammar for our language is simply the exploration of the grammatical principles which are ‘ours’—those principles can have no absolute normative force. Many readers of A Theory of Justice initially read Rawls as offering a universally applicable theory of political justice. 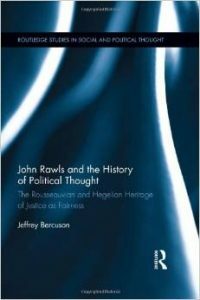 Bercuson is right to emphasize that Rawls sees himself, rather, as merely elaborating the principles implicit in ‘our’ historical liberal tradition. In doing so he does not rescue Rawls from his critics, but rather reinforces the paradox of a political morality which can offer no justification for itself except for the fact that it happens, historically, to have been ‘ours’.